While the Halloween festivities may be over, now the challenges begin with the worries about what all that sugar and candy may be doing to your children’s dental health. While the Halloween festivities may be over, now the challenges begin with the worries about what all that sugar and candy may be doing to your children’s dental health. Since it can be difficult to keep your teeth clean from the endless bags of candy and trick-or-treating. Halloween certainly presents parents with a variety of health and safety challenges. Here’s a few tips for how you can help your family’s teeth stay healthy this Halloween. To maintain healthy teeth, eat Halloween candy and other sugary foods with meals or shortly after mealtime. Saliva production increases during meals, which helps cancel out the acid produced by bacteria in your mouth. Additionally, the saliva helps to rinse away leftover food particles. It’s best to avoid hard candy and other sweets that tend to dwell in your mouth for long periods of time. Sugary foods that stay in your mouth for extended periods of time cause tooth decay. Try to avoid sticky candies, like taffy and gummy bears, which cling to your teeth. These sticky candies make it hard for saliva to wash leftover particles away, increasing the risk for cavities and tooth decay. Drinking fluoridated water can help prevent tooth decay and flush away leftover sugar particles stuck in your teeth. Be sure to also avoid sugary beverages when eating an increased amount of candy. Try to stay away from soda, sports drinks, and fruit juices during this time of year. You should brush your teeth twice a day for two minutes with fluoride toothpaste to remain in good oral health. Remember to replace your toothbrush every three to four months, or sooner if the bristles become frayed. Floss once a day to get rid of decay-causing bacteria that your toothbrush cannot reach. Regular visits to your Longmeadow dentist can help prevent problems from occurring, and they can prescribe treatment for those problems that do occur. 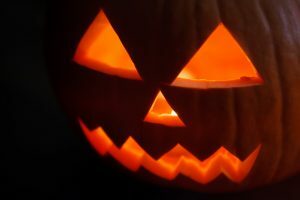 In order to keep your teeth healthy for many Halloweens to come, make an appointment today with your Longmeadow dentist. Refers to a thin layer of epidermis shed from the surface.